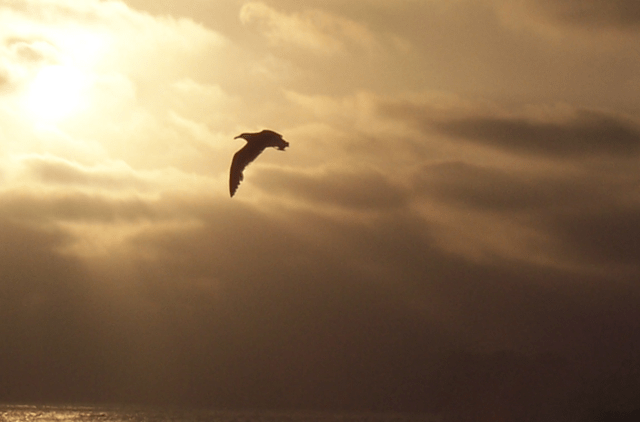 Seagull and sunset over La Jolla Shores, San Diego. If you’d like to really get to know your students, just ask them about their history. Where are their roots? Where are their people? Where is their heart? Because while students are, obviously, where they are now, they are also, and probably more importantly, the journey that got them there. And the journey, the history, is often what they hold nearest to their soul. Students, while they are young, also have histories–places they’ve lived, horrors they’ve witnessed, great joys, and great losses. They come to us with their Nike’s and their iPods, and we’ll never know their backstory if we don’t ask. But don’t be fooled by their youth: Don’t think that, just because your students are young, that they don’t have a past, a history, and a journey worth writing about. Enter the Where I’m From poem. This poem starts small–with a list of words and phrases, and then grows into stanzas of similarly grouped topics. These topics are then developed, elaborated upon, fleshed out into lines of descriptive poetry. It is important to emphasize to students that they are not creating a timeline or a list as their final product, but either of those may help in the early stages of developing the poem. The best place to start is with the original Where I’m From poem by George Ella Lyon on her website. You’ll find the text of the poem as well as audio of Lyon reading the poem herself and several other examples. If you teach creative writing, the Where to Go With Where I’m From section can also lead to writing projects that can piggyback on the poem students create. Here is a sample poem. I wrote it when I taught Creative Writing a few years ago. Feel free to use it an example if you’d like to, but please include my name and do not make any changes to the content. while pelicans and Navy helicopters and the GoodYear blimp float by overhead. orange-red-purple orb of west coast idealism. the waters of Mission Bay sparkling like a liquid sequined dress. These are the sandy landmarks of my life. the Casa del Prado and the California Tower in Balboa Park. wrapped around me like a beloved blanket. I am from my namesake, my grandmother whose love was unconditional, pervasive, and life preserving. their lives creating a frenzied dance of multiple exquisite dysfunctions. while mine was a tumbled mixture of the familiar and the unknown. apricots and figs, kiwis and pomegranates as red as blood. If you decide to try this poem, you may find the rubric I used helpful. While some people find assessing poetry to be difficult, I see it as another form of writing with many of the same expectations for minimum requirements, clarity of expression and understandable meaning. This is the rubric I’ve used in the past, and I’ve had great success with it, but you may wish to alter it to something more objective. I hope you and your students enjoy writing about Where You’re From! guacamole and pico de gallo,”…awesome! Great post, so informative and helpful.